Carteret Correctional Center is located in Newport North Carolina. It is a minimum security prison that houses 300 male offenders. Inmates can earn a GED and receive vocational training in horticulture while incarcerated here. Additionally, offenders can receive alcohol and substance abuse treatment. Many of the inmates at Carteret Correctional Center work jobs within the community and inside of the prison. Job duties for inmates include road crews, landscaping, maintenance and kitchen staff for the prison. Some inmates at Carteret Correctional Center may be eligible for work release, which allows the inmate to work a job within the surrounding community during the day, and return to the facility at the end of their shift. Work release is an important aspect towards preparing an inmate for their release, as it allows the offender to earn a wage, and to get accustomed to daily work life. 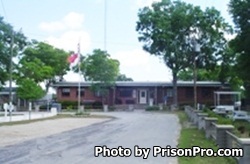 Carteret Correctional Center uses an alternating visitation schedule that goes by the inmates last name. The first letter of the inmates last name will determine if they have the morning or afternoon visiting session. Because of this you will need to call the facility for the current rotation. All visits occur on Saturdays in two sessions the morning session from 8am-11am and the afternoon session from 1pm-4pm. Legal visits must be scheduled in advance and occur Monday through Friday.